The Orange Spirit Nation, serving the Tustin and Irvine areas of Orange County, California, hosts two recruiting events each year, one in late summer, and one right after the kids are back in school. We find that getting an early start on the year by hosting a summer event works particularly well. This year, our annual skate party drew over 150 people. Held on a Sunday in late August from 11:00 to 1:00, this event is hosted by the nation, and all family members are welcome, including moms. In addition, prospective members and their families are encouraged to attend. We have found that including, and in fact targeting moms in our recruiting efforts is very effective. Each family was asked to bring a few cans or boxes of food, and as a result, we were able to donate several hundred pounds of food to the Second Harvest Food Bank of Orange County. This is a low cost, fun event that gives our families the chance to reconnect before the official year starts in September, gives everyone a chance to meet each other’s entire family, and helps to build our community at the start of the year, and give something back at the same time. This was just our second year hosting this event, but you can be sure it will stay on our nation calendar for good. 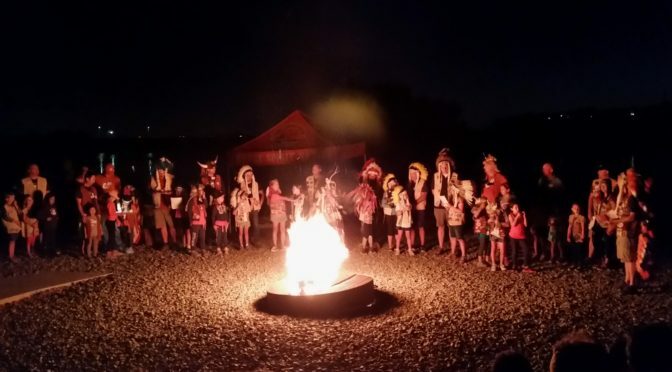 Three weeks later on September 9th , the we hosted our annual kickoff event, a mock campout at Lake Oso in Rancho Santa Margarita. This event is designed to enable prospective new members to “test drive” a campout without committing to an entire weekend. At Lake Oso, we do everything we normally do on a campout except spend the night. This year, food was provided by the nation, but each tribe was on its own for smores!!! As the photo indicates, we introduced our entire nation council at the campfire. We have found that this event is a great way for new and prospective members to get to know each other just as the new year is beginning, and for prospective members to experience the tribe and nation camaraderie first hand before they join. OSN currently has 335 members in 7 tribes, and we still don’t have all of our returning members or prospects signed up. Under the leadership of Nation Chief Scott “Laughing Fox” Fedewa, it looks like we are off to another great year.